Libby on the Label: #52 Ancestors Week 14 - "The Maiden Aunt"
#52 Ancestors Week 14 - "The Maiden Aunt"
You know what they say. Single women over the age of 35 are more likely to be killed by a terrorist than get married. It looked like my 2nd great aunt, Annie Eliza Thompson (1866 - 1939), would defy the odds. She was single up until the age of 45. Her wedded bliss was short lived as her husband died three years after they were married. For all but those three years of her life she was "the maiden aunt". Annie was one of nine children. Her oldest sister, Albertina Amanda Thompson Park, was my paternal great grandmother. I found out a lot about her, and my extended family, through the census. I was pleasantly surprised how Aunt Annie's life turned out, even though she didn't have a long marriage or children. By 1901 the Thompson household consisted of Annie Eliza (age 35), her father Andrew (age 74) and younger sister Charlotte, also known as Lottie (age 30). Matriarch Anne passed away in 1899. Both of the ladies were working, Annie as a dressmaker and Lottie a book keeper, typical jobs for women in the Edwardian era. Andrew died in 1907, six years later, and I lost track of Annie. Charlotte turned up as a lodger living in a nearby neighbourhood in Chatham, Ontario in 1911, but I couldn't find Annie. I assume they had to sell the family home. Annie resurfaced in the most unexpected way. I wasn't even looking for her at the time! I was researching my paternal great grandfather, Grandma Albertina's husband. 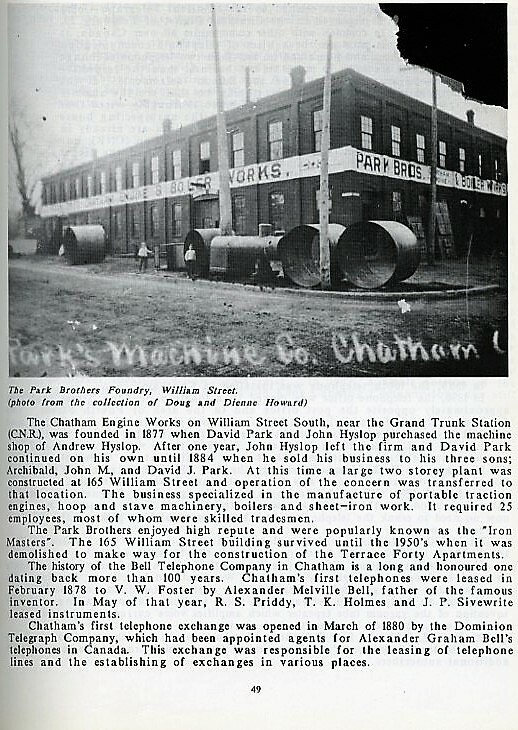 Someone from the Chatham-Kent Museum sent me a photo of the foundry building my great grandfather, Archie Park, owned with his two brothers. One of those brothers was John Mungo Park. When I was trying to put together John Mungo's life, I noticed that he had three wives, and children with 2 of them. They both died before their times; Emma Oldershaw at age 27 and Annie Jane MacDonald at age 47 from Bright's disease. Wife #3 was none other than Annie Eliza Thompson. She married her sister's (my great grandmother) brother in law! That was in 1914. She was 45 years old. Sadly, three years later, on Christmas Eve, John Mungo Park passed away from heart disease. He had the condition for a period of two years, which makes me wonder about the marriage. Being in-laws, it's safe to assume they had known each other for a long time. Annie was a woman on her own, and John was ill. Perhaps the marriage was arranged by Archie and Albertina. What ever the case may be, it turned out well. Annie could take care of John in his declining years and marrying John Mungo made her financially secure for the rest of her life. In the census of 1921, Annie was 60 years old and living as head of the household at 265 Queen Street in Chatham, Ontario. 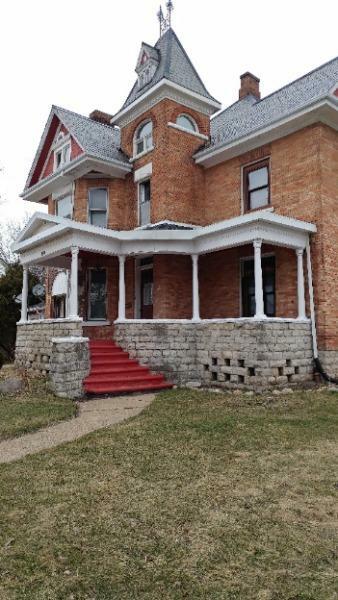 The house is still standing and is currently an apartment building (with an available suite to let)! Annie shared her good fortune with sister Charlotte, who was still working as a book keeper. She had never married. Also living in the home was Annie's mother-in-law, John Mungo's mum (and my 2nd great grandmother by his brother, Archie Park) Julia Ann Gardiner Park. 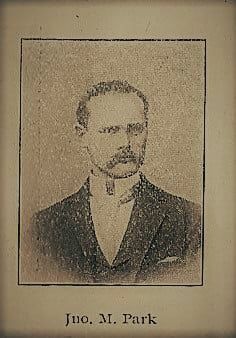 Julia Ann's husband, my 2nd great grandfather, David Park, died in 1913, the year before John Mungo and Annie married. David Park's death record lists the cause death as "senility" at 87. That didn't mean he had diminished mental capacity, like we think of senility today. In those cases the cause of death would be listed as "senile dementia" or "senile insanity". There was no such thing as political correctness back then. Typical census questions asked were whether anyone was deaf, dumb, blind, insane or idiotic! Senility meant that the body had ceased to function properly because of advanced age. Julia Ann was living with their son George and his family in the 1911 census which makes me think that perhaps David was in a nursing home. In the 1935 Canada Voters Lists, Miss Lottie Thompson, book keeper, and Mrs. J. Park, widow, were two single ladies living at 265 Queen Street, Chatham, Ontario, Canada. A spinster and a dowager. They lived within walking distance of their brother Charles Lockhart Thompson and my grandmother Albertina Thompson Park and their families until they died. I'm happy to remember these two maiden aunts. Did they have their hearts broken or were they leading fulfilled lives without a husband? When you read about a woman's place in the world during their eras, I think they both did just fine.